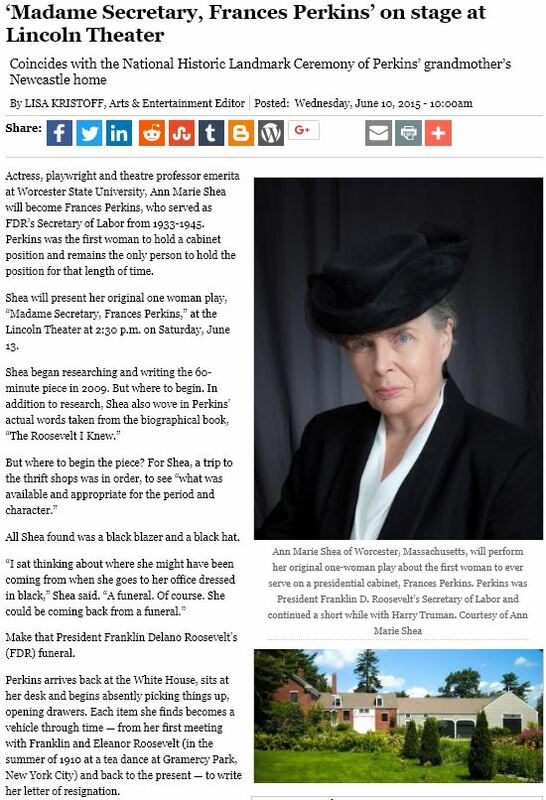 Actress, playwright and theatre professor emerita at Worcester State University, Ann Marie Shea will become Frances Perkins, who served as FDR’s Secretary of Labor from 1933-1945. Perkins was the first woman to hold a cabinet position and remains the only person to hold the position for that length of time. Shea will present her original one woman play, “Madame Secretary, Frances Perkins,” at the Lincoln Theater at 2:30 p.m. on Saturday, June 13. All Shea found was a black blazer and a black hat. Make that President Franklin Delano Roosevelt’s (FDR) funeral. Perkins arrives back at the White House, sits at her desk and begins absently picking things up, opening drawers. Each item she finds becomes a vehicle through time — from her first meeting with Franklin and Eleanor Roosevelt (in the summer of 1910 at a tea dance at Gramercy Park, New York City) and back to the present — to write her letter of resignation. Perkins held degrees in economics, physics and social. Over the years she developed her own theories about poverty, the sources of it, why it drove some to alcohol, and other means, to ward off the depression it produced, etc. 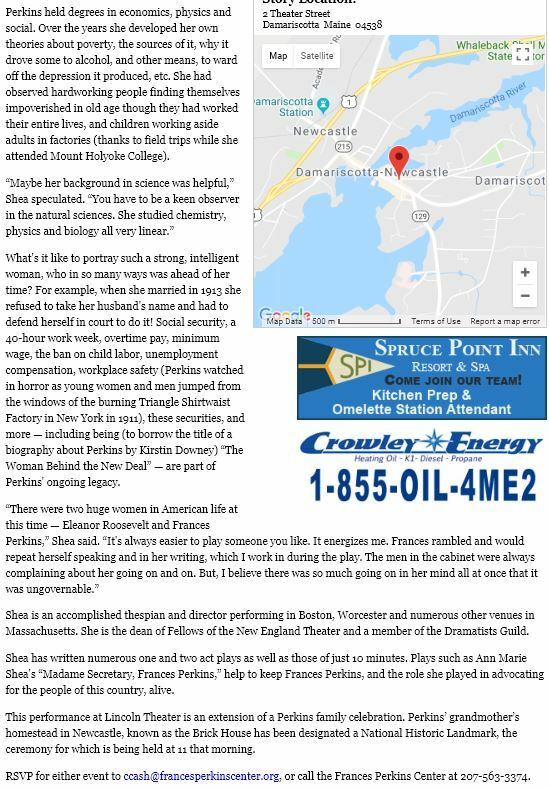 She had observed hardworking people finding themselves impoverished in old age though they had worked their entire lives, and children working aside adults in factories (thanks to field trips while she attended Mount Holyoke College). What’s it like to portray such a strong, intelligent woman, who in so many ways was ahead of her time? For example, when she married in 1913 she refused to take her husband’s name and had to defend herself in court to do it! Social security, a 40-hour work week, overtime pay, minimum wage, the ban on child labor, unemployment compensation, workplace safety (Perkins watched in horror as young women and men jumped from the windows of the burning Triangle Shirtwaist Factory in New York in 1911), these securities, and more — including being (to borrow the title of a biography about Perkins by Kirstin Downey) “The Woman Behind the New Deal” — are part of Perkins’ ongoing legacy. Shea is an accomplished thespian and director performing in Boston, Worcester and numerous other venues in Massachusetts. She is the dean of Fellows of the New England Theater and a member of the Dramatists Guild. Shea has written numerous one and two act plays as well as those of just 10 minutes. Plays such as Ann Marie Shea’s “Madame Secretary, Frances Perkins,” help to keep Frances Perkins, and the role she played in advocating for the people of this country, alive. This performance at Lincoln Theater is an extension of a Perkins family celebration. Perkins’ grandmother’s homestead in Newcastle, known as the Brick House has been designated a National Historic Landmark, the ceremony for which is being held at 11 that morning. RSVP for either event to ccash@francesperkinscenter.org, or call the Frances Perkins Center at 207-563-3374.